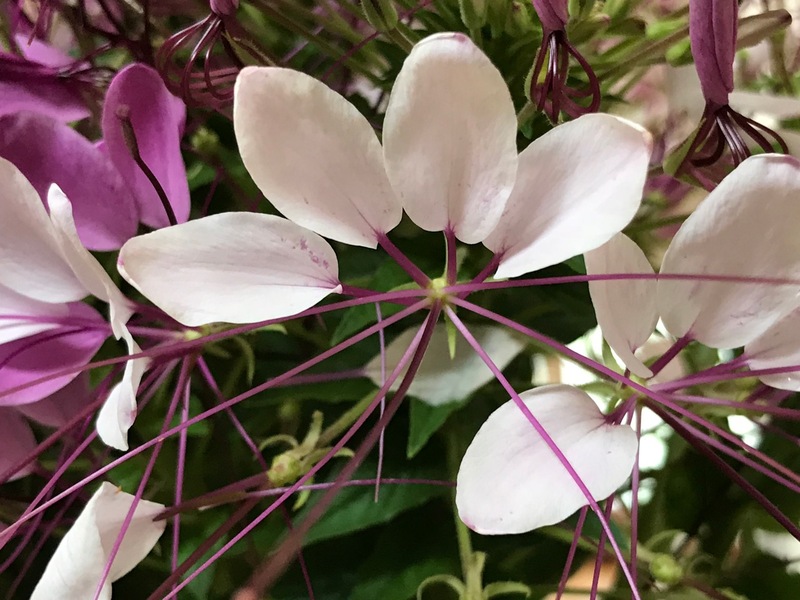 Cleome is so pretty, but I have not succeeded in growing it myself but have tried more than once, so it is good to see yours – and in close up too. Very different from your usual style – but hey! why not?! Cleome has reseeded here all around the garden. It’s very easy to pull out in unwanted places. Lucky you to have it on tap!! Thanks! The photo doesn’t do the cleome justice. Very pretty! Pink is probably my favorite color in flowers and the silver wormwood compliments it beautifully! Every year I keep telling myself I need to grow Cleome! Thanks Joanna. I love the structure of cleome. One of the few things I can grow from seed. 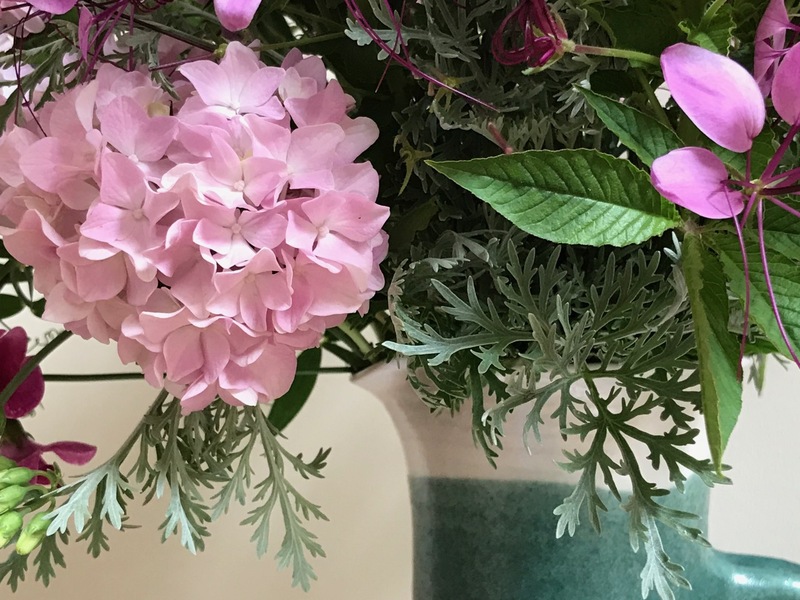 A beautiful and soft arrangement to cool the summer heat. Thanks Peter. It has been a hot summer but just in the last couple days we’ve had a wonderful reprieve from the humidity. Oh I love this sea of pink. Simply beautiful. Thanks Alison. “Sea of Pink” would have make an apt title! That’s pretty sweet. 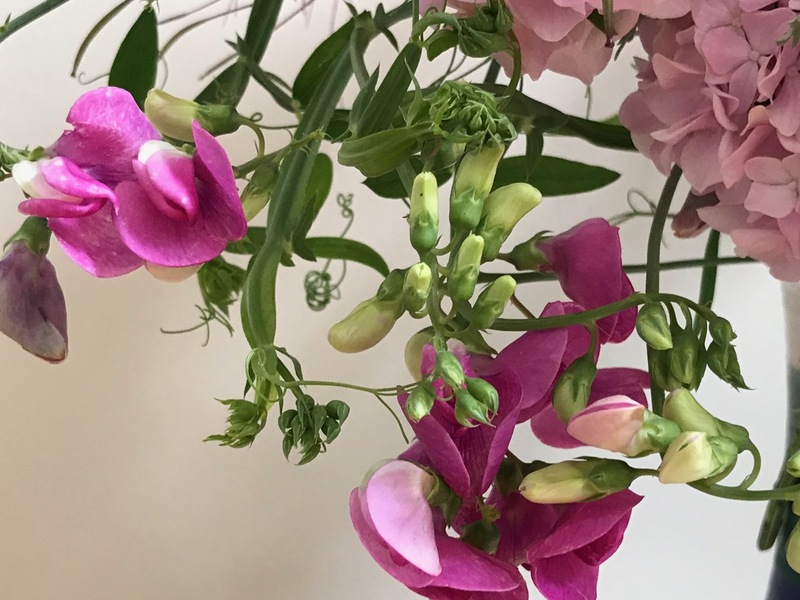 I do not think of perennial pea as a cut flower. It is a roadside weed here. I have tried planting it in the garden, but it only wants to grow where it self sows, on the side of the road. While everyone else was getting weirdly warm weather, our weather has been weirdly mild, keeping the peas blooming until just a few weeks ago. There are probably still a few out there in cool spots. 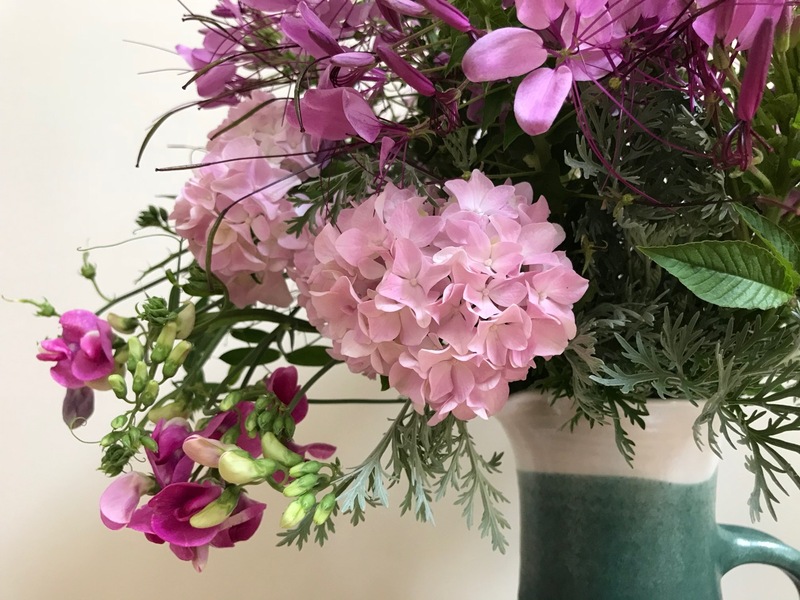 Thanks.This perennial sweet pea lasts pretty well in a vase and the flowers evolve toward blue as they fade. I have tried to grow it from the seed from the side of the road, but it does not cooperate. It prefers to grow in sites that it selects. Seriously, it grows wild, but does not want to cooperate in cultivation. I got my seed fromt he white ones, hoping that even if I got a few pink ones, I would be more likely to get at least one white. Only a few grew, and they did not survive long. 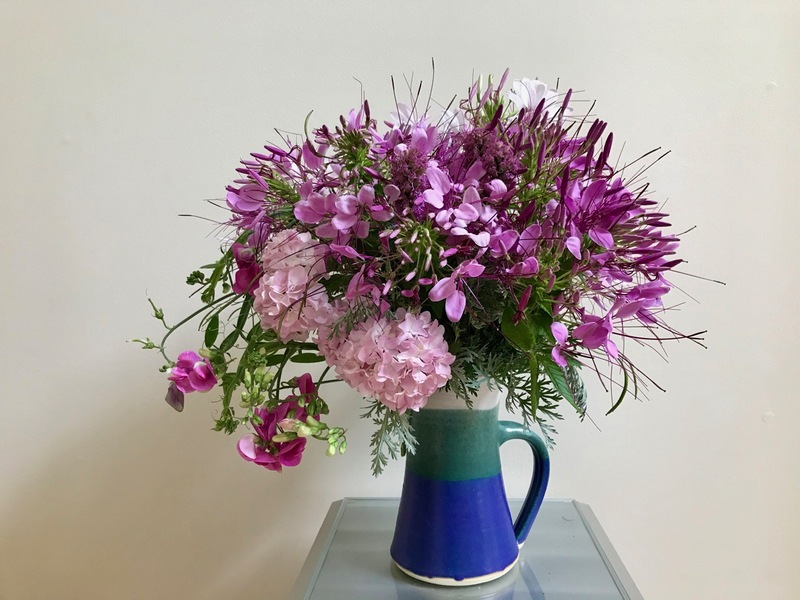 I love your vase, which coincidentally reminds me of one of my own this week – the colors are similar even if the flowers are very different. As the scorching heatwave that hit Friday and continued through the weekend here incinerated a lot of my flowers, I’m considering purchasing some Cleome plugs as temporary fillers because they have a reputation for holding up to heat. I’ve got some local bloggers scheduled for a visit next Monday and my garden looks awful so I feel the need to do something! My cleome were under great stress due to lack of rain and weren’t looking good at all. Finally we had rain and it refreshed and revived them. Hope the heat abates, but I’m sure your local bloggers will love their visit to your beautiful garden. Absolutely lovely – gorgeous pinks. And I LOVE the jug! Thanks Sam. The pitcher was a wedding gift (41 years ago) and I’ve always loved the colors and shape. Made by a local potter. Always so impressed with anyone who grows Cleome, having totally failed myself. Especially when they are as beautiful as this. Well thank you. Cleome is one of the few things I’ve been able to grow from seed, but it now just reseeds year after year. The Cleome has a wonderful texture en masse. Does it last long in a vase? The rest is pretty in pink and I love the grey green accents. 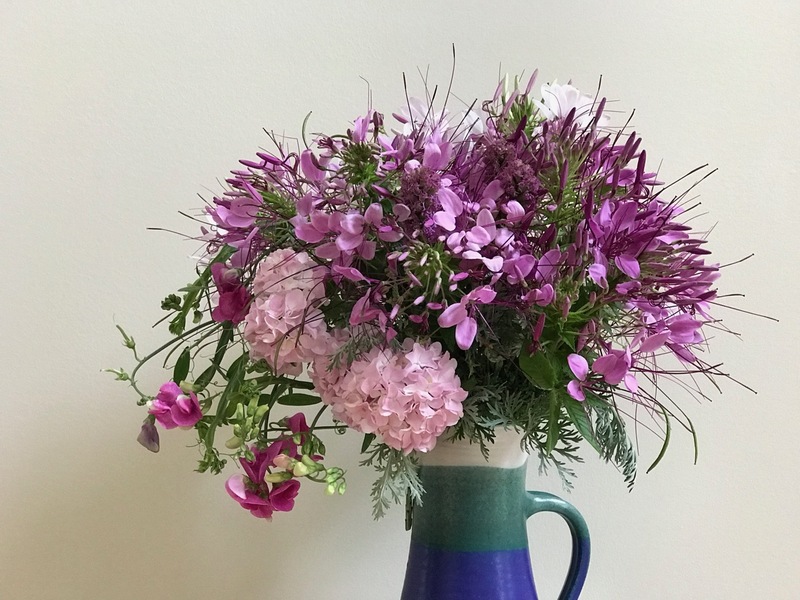 Cleome doesn’t really last that well in a vase. It soon starts dropping its varied pieces and parts, but it’s good for several days. I like Cleome, but was always afraid of it getting loose in the garden. It does sift around the garden but young seedlings are easy to ID and remove. I usually leave them as they seem to know how to arrange themselves in a lovely way (but then my garden is full of free-range plants). I love this arrangement, so bouffant ! can’t even remember he last time I grew Cleome-it’s been years and years.. Yes, bouffant! I don’t remember when this cleome was planted–years ago–and it’s still coming back. I love Cleomes! I wish I had more sun for them…thinking about a spot in the future. Your vase is gorgeous, as always! I love the pinks and purples! 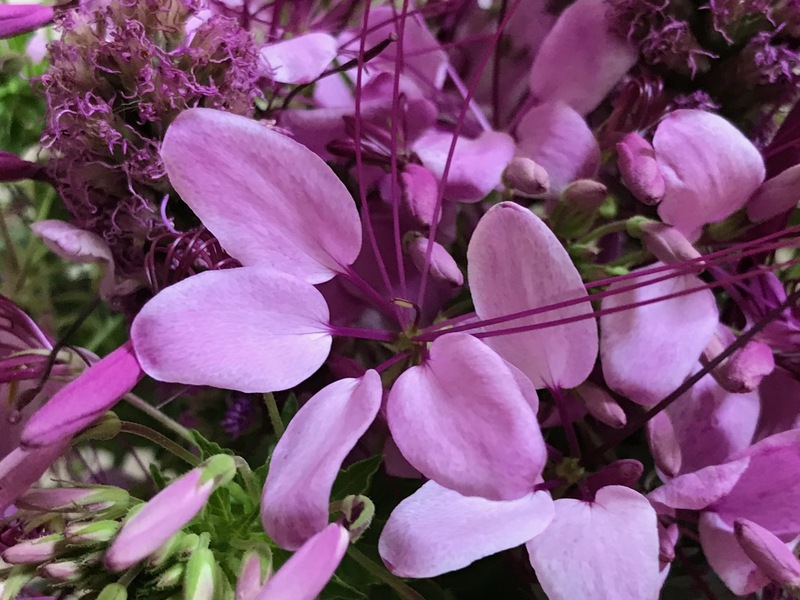 I love cleome and used to grow it in my last garden, it makes a great flower for a cut flower vase collection. Hi Ronnie, yes cleome is a nice vase flower, although mine don’t seem to hold up more than a couple days. I really like Cleomes. For some reason they don’t self-sow in our garden. Too bad yours don’t self-seed. My cleome have become a little too happy in the meditation circle. I need to clear them so I can walk the labyrinth, but I hate to pull up something blooming.